Let’s start with the most obvious boringness, the game itself. Three zip into the third quarter? A plethora of punts? Geez, that was awful. And I live in New England! Saying “Go Pats!” to my friends prior to the game was more interesting than watching a game that the Pats ended up winning. Yeah, the last few minutes were pretty good but the first 55 minutes, not so much. At one point I had to do some yoga to prevent myself from falling asleep. Maybe it’s just me. The Super Bowl does not intersect with any of my fandoms. I’m not into professional football. Heck, I don’t normally watch television at all. In a non-Olympic year, I watch maybe ten hours total in an entire year. I’m not a fan of the artists from the halftime show, and I’m not into most of the products advertised because I don’t drink beer or eat junk food. Let’s talk about the commercials for a moment. 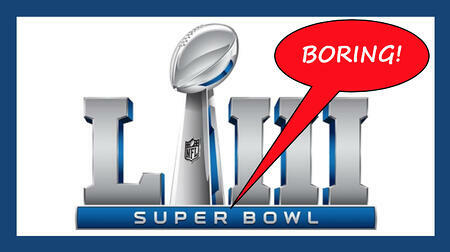 I used to love watching the Super Bowl for the commercials. It was awesome to see something thought provoking, simple, and funny like my two all-time favorites: Monster.com “When I Grow Up” and Tabasco “Mosquito”. I’m writing this about ten hours after the game finished, and there were only three companies whose commercials stuck with me overnight. All of those were different than the other cookie-cutter ads. All made me think. The ones I liked were from Google “100 Billion Words” and “Veterans Job Search”, the Washington Post “Democracy Dies in Darkness”, and MassMutual. The other commercials all seemed the same to me – loud and obnoxious. They were dreadfully boring in their sameness. Many would be 20 seconds in, and I couldn’t tell if it was a loud action sequence promoting a loud action movie or a loud action sequence promoting a loud action television series or a loud action sequence promoting an automobile or a loud action sequence promoting some other product. Mostly I would take in about ten seconds and then turn the sound off because it was so utterly grating. Oh, and three kinds of Pringle’s stacked on top of one another? What’s up with that? Yes, you caught me. I did remember another ad. Pringles. Because it kind of makes me feel queasy. Is our world so polarized now that we have to constantly shout to be heard? It certainly seems so with politics. And with Super Bowl ads. The “PEPSI SUPER BOWL LIII HALFTIME SHOW” (yes, it is officially in all caps) featured Maroon 5 with Travis Scott and Big Boi. The problem here was that in just a few short minutes you can’t please every musical taste so broadening the show to include multiple genres just served to make it way too bland. And therefore boring. I love live music and have seen over 750 live shows. The PEPSI SUPER BOWL LIII HALFTIME SHOW was an opportunity to feature an interesting artist. But by trying to appeal to everyone, the show appealed to very few. Maybe I’m becoming a crusty old curmudgeon like your great uncle who people shun during holidays. I sure hope not, but that’s possible. I’d love to hear some other thoughts on the Super Bowl broadcast.